A burgeoning California destination nestled in the Santa Lucia Mountains of Central California midway between Los Angeles and San Francisco, Paso Robles offers a stunning retreat for both cycling and wine enthusiasts. From May 19-22, Paso Robles will host two consecutive high profile events Stage 5 of the AMGEN Tour of California on May 19, followed by the renowned 29th Annual Wine Festival taking place May 20-22. The largest cycling event in America, the 2011 AMGEN Tour of California is a Tour de France-style cycling road race presented by AEG that challenges the world�s top professional cycling teams to compete in a demanding course from May 15-22, 2011. The Stage 5 finishing line of the 2011 AMGEN Tour of California is located in downtown Paso Robles. Now in its 29th year, the Paso Robles Wine Festival, taking place May 20-22, 2011, celebrates Paso Robles wine country by bringing more than 90 area wineries to the Downtown City Park. In addition, local artisans and chefs will be found throughout the weekend engaging their cuisine in a dance that highlights the best of both food and wine. One lucky winner will have the opportunity to experience three days of both cycling excitement and wine tasting by entering the �Come for the Race, Stay for the Wine Sweepstakes,� hosted by the Travel Paso Robles Alliance (TPRA). From April 7-28, consumers are encouraged to enter this social media sweepstakes for the chance to win a pair of VIP AMGEN Tour of California tickets, RESERVE tickets to the Paso Robles Wine Festival and a complimentary two night stay (a total value of $1200). The two VIP AMGEN Tour of California tickets include special reserve seating, passes to the AMGEN Tour VIP tent, access to the VIP post-race party and AMGEN gift bags. The two Wine Festival RESERVE tickets include access to the RESERVE wine tasting event on Friday, May 20 featuring a special tasting and auction of library and reserve wines, power whites/ros�s and futures; access to the Winemaker Seminar on Saturday, May 21; and early admission to the Grand Tasting on Saturday, May 21. Cyclists will delight in Paso Robles� serene natural beauty and seemingly endless miles of quiet roads ideal for riding. With more than 200 wineries, wine lovers can choose from endless options to taste the area�s 40+ wine grape varietals and blends - from Spanish to Italian to Bordeaux and Rh�ne, including the area�s heritage variety, Zinfandel. As California�s fastest-growing wine region, Paso Robles boasts six different wine regions to explore, each with their own distinct microclimate and terroir including the Back Roads Wineries, Far Out Wineries, Pleasant Valley Wineries, Downtown Wineries, 46 East Wineries and 46 West Wineries. For those who wish to combine cycling and wine tasting, Highway 46 West offers spectacular scenery and some of the area�s top wineries. The �Come for the Race, Stay for the Wine Sweepstakes� entry window is open from April 7-28, 2011. To enter the sweepstakes, consumers are asked to �like� Travel Paso�s Facebook page at www.facebook.com/TravelPaso. Then, click on the Travel Paso �Sweepstakes� tab and follow the simple sign up process. The sweepstakes closes on April 28, 2011 at 11:59 a.m. (PST). The TPRA will announce the winner on April 28 at 3 p.m. (PST) via Travel Paso�s Twitter www.twitter.com/travelpaso and Facebook www.facebook.com/TravelPaso accounts and on www.travelpaso.com. The two night stay is valid on Thursday, May 20 and Friday May 21, 2011 only. The winner will be responsible for all transportation and any additional accommodations. Must be at least 21 years of age to enter. Limited to one entry per person. The largest cycling event in America, the 2011 AMGEN Tour of California is a Tour de France-style cycling road race presented by AEG that challenges the world�s top professional cycling teams to compete in a demanding course from May 15-22, 2011. The Stage 5 finishing line of the 2011 AMGEN Tour of California is located in downtown Paso Robles. For more information, visit www.amgentourofcalifornia.com. Now in its 29th year, the Paso Robles Wine Festival, taking place May 20-22, 2011, celebrates Paso Robles wine country by bringing more than 90 area wineries to the Downtown City Park. In addition, local artisans and chefs will be found throughout the weekend engaging their cuisine in a dance that highlights the best of both food and wine. RESERVE, held on the evening of Friday, May 20, will lead consumers through an exploration of library, reserve, power white/Ros�s and futures. On Saturday, May 21 and Sunday, May 22, the Grand Tasting will feature more than 400 wines, local culinary artists, chef demonstrations and live music beneath the oaks of the Paso Robles Downtown City Park. For more information, visit www.travelpaso.com. Nestled in the Santa Lucia Mountains of the Central California Coast midway between Los Angeles and San Francisco, Paso Robles is an affordable and welcoming retreat that offers the authentic California experience. An extensive variety of activities and experiences offer something for everyone including untouched natural beauty, a bounty of farm fresh cuisine supplied by local organic and specialty farms and the nearby Pacific Ocean, more than 200 wineries, renowned cultural attractions, first-class shopping, golf and entertainment, and much more. Visitors can choose from a wide selection of accommodations, from luxurious resorts and boutique inns to leading brand hotels and affordable, family friendly motels. For information on how to make the most of your stay in Paso Robles, visit www.travelpaso.com or contact (805) 227-PASO, tourism@prcity.com. For the latest news on the area, visit http://blog.travelpaso.com, join us on Facebook www.facebook.com/travelpaso and follow us on Twitter www.twitter.com/travelpaso. The Travel Paso Robles Alliance (TPRA) was founded in 2008 by a group of 19 area hoteliers with the mission to help business, leisure and group travelers discover the Authentic California� experience of the Central Coast. The alliance offers information for the 1,100 luxury, specialty, value, and budget room choices available to visitors. The organization consists of owners and operators of luxurious resorts and inns, leading brand hotels, quaint bed and breakfasts, motels and budget accommodations. For more information on the TPRA, visit www.travelpaso.com or contact (805) 227-PASO, tourism@prcity.com. For the latest news on the area, visit http://blog.travelpaso.com, join us on Facebook www.facebook.com/travelpaso and follow us on Twitter www.twitter.com/travelpaso. Immediately following the release of information on the long-hyped 500 mini car, Fiat shows convertible version of its wee two door for the New York auto show. Powered by a 1.4-liter, four-cylinder engine as other 500s, the Cabrio adds an attractive power-operated cloth top that can be retracted at the push of a button. The Z4 sDrive 2.8i introduces an engine two-cylinders short of the previous six-cylinder Z4. This powerplant uses a single twin-scroll turbocharger to put out 240 hp and 260 lb.-ft. of torque. Horsepower peaks at 5,000 rpm and torque at just 1,250 rpm, promising low-rpm power right off the line. BMW promises 20-percent better fuel economy than the old naturally aspirated 3.0-liter inline six. This 2.8i will replace the previous 3.0-liter inline Six in the entry-level Z4. 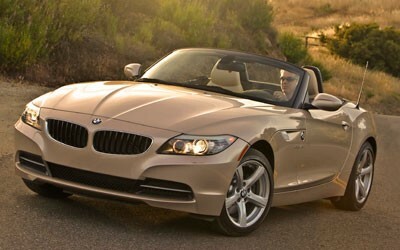 The Z4 sDrive 2.8i will be the first four-cylinder model BMW has sold in the United States in 10 years. Expect this new engine to spread through several models.